Shay Benson stepped off the bus in downtown Seattle and realized that she was on her own. She had a little money but nowhere to go. No family, no home. Just released from Purdy Corrections Center, the real world was staring her in the face and it was overwhelming. And cold! Without thinking she walked into a church near the bus stop. Of all the unlikely places to go she found herself in a church and found herself asking God, "You got anything for me?" As in answer, a man looked over his shoulder and Shay realized she was not so alone after all. Pastor Drew Douglas was deep in his own prayer as one who felt he was at his wits end. His wife died from cancer, his church attendance was down and he could use some help with his two children. Even after three years he couldn't seem to get on with things without her. This quiet meeting between Shay and Drew sets the tone for a wonderful story of faith, courage, second chances and love. 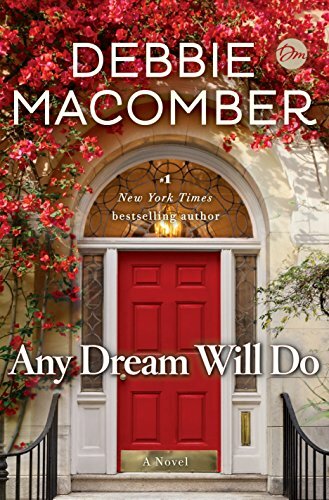 Any Dream Will Do is the latest novel from beloved author Debbie Macomber. Written with well developed characters, the book is full of hope for those who seem to have lost their hope. Shay has faced trouble since the death of her mother. Her father was bitter and abusive and she was responsible for her younger brother Caden. When she is seduced by the promise of love and escape from her father by her boyfriend Shooter, she finds instead an uglier world with a dangerous gang leader. Her brother is also drawn into this lifestyle and her story begins to spiral out of control. The love she has for her brother leads her to embezzle money to ward off gang members greedy for him to repay a loan. Off to prison she went without another word from Caden. Drew was startled from his prayers by Shay and immediately rose to help her. With his help she was able to enter Hope Center, a program that was designed for women who needed a second chance. The program had strict guidelines but she worked hard, graduated from the program and was ready for her new life with a new job and a new home. Shay was grateful to Drew for seeing her as she could be, not as the woman who served time in a prison. Her life was not easy yet it was better than she could remember. She found her faith and it stood her in good stead when troubles came her way. Life doesn't always prepare you for those times when your past encroaches like an unwelcome guest. With Drew's help she finds her way. Drew had faith in Shay and when things threatened to hurt her he was at her side. As her past came to light to more members of the congregation, doubt reared its head. Shay's resilience was admirable. This is a well written story for anyone who has ever doubted their own courage to dream for a better situation in life. It is uplifting and enjoyable. When asked what her dreams were, Shay couldn't answer. She was told, "Any dream will do." These four words were used more than once and were such an encouraging theme. Many thanks to NetGalley and Ballantine books for the opportunity to review this book. It's late autumn and Grace Mallory has been in hiding for nearly a year. She holds the secret her father carried before he was gunned down before her eyes on the streets of Denver. Greed is at the heart of the matter when a mine owner learns his fortune is at stake. 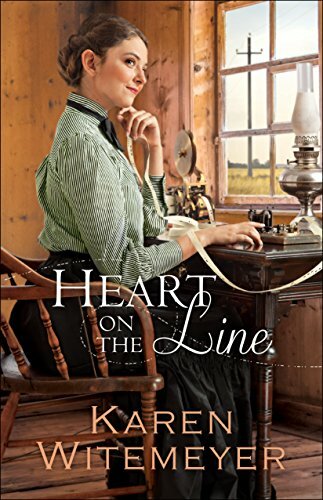 Heart On The Line by Karen Witemeyer is set in 1894 in the old west, making it a good book to sit back and enjoy with a nice cup of tea. Our heroine is a telegraph operator who has been "on the line" after hours with one Amos Bledsoe forming an innocent, yet warm friendship. One night as they were "chatting", their discussion is interrupted by an urgent telegraph message that Grace's whereabouts have been discovered. She enlists help from the local lawman but help comes from another surprising source. Amos "overheard" the coded message and swiftly moved everything to catch a train then rent a stubborn mule to come to her aid. What followed is a tale that has the flavor of the late 19th century, colorful for its innovations. I liked the book for the sense of adventure; a young woman in hiding, rescued by an unlikely hero. Amos was a mild mannered, bespectacled man who lived with his mother. A telegrapher by trade his preferred method of transportation was a velocipede. Amos made no secret he would rather ride a bicycle than a horse and this caused enough curiosity among the town that added fun to the story. For every wonderful young man with a good heart there is a handsome rake that can turn women to putty in his hands. This man was wearing the badge of a Pinkerton; one who seemingly searched long and hard for Grace. Under the guise of protection, he assured her he was sent to personally carry out what her father intended to do before he was shot. Justice would be served. The man who killed her father is not one to letting sleeping dogs lie. Although he didn't personally pull the trigger, Chaucer Haversham had men on his payroll who would do anything to keep the man's fortune from slipping to a long thought dead sister. Deception and relentless determination tested Grace's resolve. In the end, I think one should pick up a copy of Heart On The Line to solve the mystery and see who wins the heart of Grace Mallory. From the bicycles to the parallel of chatting on the wire to online chatting I think the author brought 1894 up to speed with 2017. Many thanks to Bethany House for the opportunity to read this book in exchange for an honest review. What better way for a woman to share her love of cooking than by teaching others. Heidi Troyer was a wonderful cook who decided to invite people into her home for cooking lessons. Her Aunt Emma was a master quilter and to help conquer her loneliness as a widow she started teaching others to quilt. Heidi knew that Emma got much more in return from her students than just seeing their completed projects. So, Heidi, in turn, prayed that by giving simple cooking lessons she could bless others while adding purpose to her own life. Her first classes were successful so she planned to teach another series of lessons. She and her husband Lyle have been married nearly nine years yet remain childless. After years of longing for a child, they are looking forward to adopting a baby. As things happen in life, the best laid plans don’t always come to fruition. Disappointed and hurt, Heidi buoyed herself with her deep faith and strength of character to overcome the sadness after learning the adoption fell through. With Lyle’s encouragement, she went ahead with her plans teach another series of classes. The first day of class brought an unexpected mix of eager students. From the lonely wife of a policeman to a teen struggling to fill the shoes of the mother who walked out on the family, Heidi welcomes them all to her home. Even her mailman smelled the delightful aromas and wanted to join in. Women and a few men who wanted to prepare tasty meals unwittingly found so much more in the Troyer's kitchen. Each week as Heidi wrote out the weekly recipe for the class she tucked a verse of scripture on the back of t. Devout in her faith, she prayed that someone among the group would read and need that verse before the next class. Oftentimes, the students would gather and share how uncannily a verse resonated and hit home. In her simple yet faithful way, Heidi made an impact on those who took her class. I read the first book in the series, Amish Cooking Class - where it all began when one woman decided to step out in a leap of faith to make a difference. I enjoyed the quiet way she listened, taught and prayed for her students. So much more was going on than mixing, baking and preparing food. A ragtag group of unlikely people came together as strangers and came away as friends. Each one with their own story. I invite you to see your yourself by picking up this wonderful book. 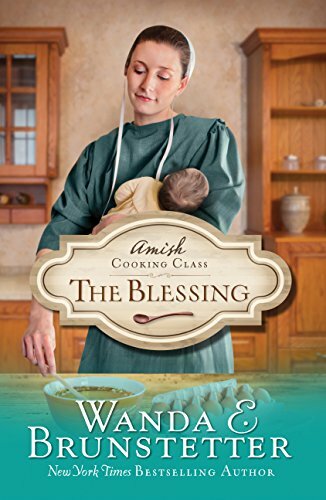 I was pleased to read the Amish Cooking Class - The Blessing, by Wanda Brunstetter for review for an unbiased review. Have you ever felt like you were right there in the midst of the story? Award winning author Lynette Eason is one of those writers who can draw the reader into the pages. 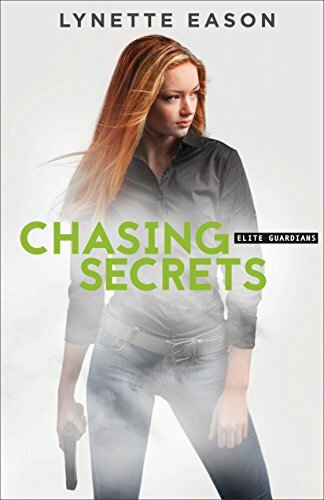 Chasing Secrets, fourth book of the Elite Guardian series is one of those books that will take you on a suspenseful ride page after page. Haley Callaghan, an Elite Guardian bodyguard finds herself in the middle of a cold case tracing back to her roots in Ireland. Bits and pieces of her childhood unfold as she finds herself in the middle of a deadly plot and she is the target. Drawing on all her resources, she intends to find whoever is at the center of this intrigue and why. Detective Steven Rothwell is not going to sit idly by and let her take this on her own. Even though Haley is a force to be reckoned with on her own, there is a deadly force encroaching on her. There are too many close calls in this case, endangering her life and the lives of people she swore to protect. In true Eason style, she wraps this puzzle into a neat package of suspense, mystery and romance. If you enjoy suspenseful novels this is a book you'll want to add to your collection.